Founded in 1884, Cantina Scacciadiavoli “cast out the devils” takes its named from a 19th century exorcist who lived in the small village bordering the vineyard. He was known to use the wines while performing his exorcist ritual of ridding poor souls of demons.Scacciadiavoli is the resulting dream of the Prince of Piombino, Ugo Boncompagni-Ludovisi. In 1884, the estate was built as a complex and modern wine “factory.” Today, the Pambuffetti family owns Scacciadiavoli. The estate is made up of 130 hectares, 35 of which make up the vineyards with an annual production of approximately 250,000 bottles. The vines cover a hill in the heart of the “Montefalco” appellation divided between the three provinces of Gualdo Cattaneo, Giano dell’Umbria and Montefalco. The winery was built in the second half of the 19th century when Prince Boncompagni-Ludovisi left Rome to dedicate himself to the art of wine production. Amilcare Pambuffetti became the third owner of the estate when he bought Scacciadiavoli in 1954. While maintaining its original architectural and structural elements, the winery was renovated and modernized in the year 2000. The winery is built into the hill consisting of four vertical levels allowing the use of gravity throughout the production. The grapes arrive from the vineyards directly at the fourth and highest level of the winery. They are then moved down to the third level where they are fermented and vinified in wood or stainless steel vats. The Montefalco Rosso DOC is brought down to the ground floor level where it is aged one year in tonneaux (500 liters) and small barrels (225 liters). The Montefalco Sagrantino DOCG and Passito DOCG is brought to the underground level where it is aged for two years in small barrels. In 1954, Scacciadiavoli was aquired by the 71 year old Amilcare Pambuffetti. It was the very same estate where he worked 60 years prior. After Amilcare’s death in 1977, his children, Alfio, Settimio and Mario, took over the estate. In 2000, the responsibility was left to the grandchildren of Amilcare Pambuffetti; Francesco, Carlo and Amilcare. 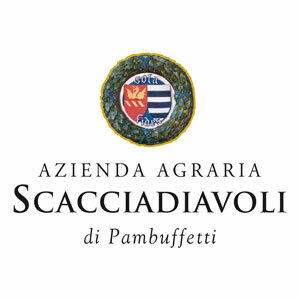 Now the oldest winery in the Montefalco appellation, Scacciadiavoli is currently run by Iacopo, Amilcare, Liu, Romeo and Fiammetta Pambuffetti. They are the fourth generation committing their time and energies to the great art of winemaking and to carrying on the name of the family estate.